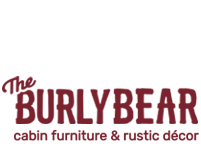 The Burly Bear’s Moose Plaid Bedding is a trip to the Northwoods! A pair of moose flanking a red canoe with classic brown and tan plaid, and plush 100% polyester microfiber suede in chocolate brown and rich crimson. The faux antler buttons and bullion fringe accents bring a bit of woodland magic to your cabin, home or lodge!